The following SAHM wishes to remain anonymous. She has been earning extra money for gifts for her kids, friends, and family, and supplementing their Christmas budget by making use of a versatile website called SwagBucks. A. We set our budget and never really had enough to allocate for all of the birthday & holiday gifts I wanted to give. I also felt that we could use a few hundred more each Christmas to make things more enjoyable. I read online about a mom who used SwagBucks to pay for their entire Christmas about a year and a half ago. I decided to give it a try. A. I just signed up for SwagBucks. It takes a minute. You can join here. A. Set aside time each day to log in and earn some points. I always book my travel (if we go anywhere, rent a car, fly, book a hotel, etc. ), shop online, fill out surveys, and print coupons from the site. If you are going to watch a movie trailer or Google something, use the site. Easy things we do each day can earn us SB points. A. I end up ‘working’ about an hour or so a week. It’s really not bad at all. I can spend as much or little time on it as I want. As mentioned above, it is usually things that I already do online that earn me SBs. So it is consistent but very flexible. A. I work a few minutes here and there while the kids are awake. If that doesn’t happen, I’ll set aside 10 or so minutes during nap-time to earn some SwagBucks. A. I would suggest saving up your points until you are at a level of points where you qualify for bonus points. I.E. if you earn 300 points you can get a $3.00 Amazon gift card. But often if you save your points until say you have 2,200 points you can earn a $25 Amazon gift card or Kohl’s or other kinds of gift cards (which gives you a 300 SB bonus just by waiting to redeem). Often there are these types of deals on Amazon gift cards and other featured gift cards like Kohl’s etc. 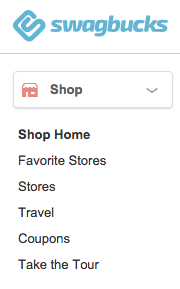 Always click on the store through your SwagBucks account to earn SBs from shopping with your earned gift card. There are also gift cards to stores that allow the use of online coupon codes & earn you SwagBucks for shopping through the SwagBucks link. I usually get the biggest bang for my buck using my points/giftcards to these sites/stores because with sales + online store coupon codes + gift cards + SBs earned from shopping at that store online = the money I’ve earned stretches the furthest. A. No. I already knew how to do everything. It’s easy stuff. A. The income varies month to month. Last year I made about $500.00. It was on average an extra $42.00 a month and basically paid for gifts for the kids, family, and friends throughout the year and some of it (about $150 was used on Christmas). If I spent more time on it I could increase what I made. But I am a busy mom and don’t want to spend much time on it. So I only spend like 10 minutes a day—usually doing things online that I normally do. A. 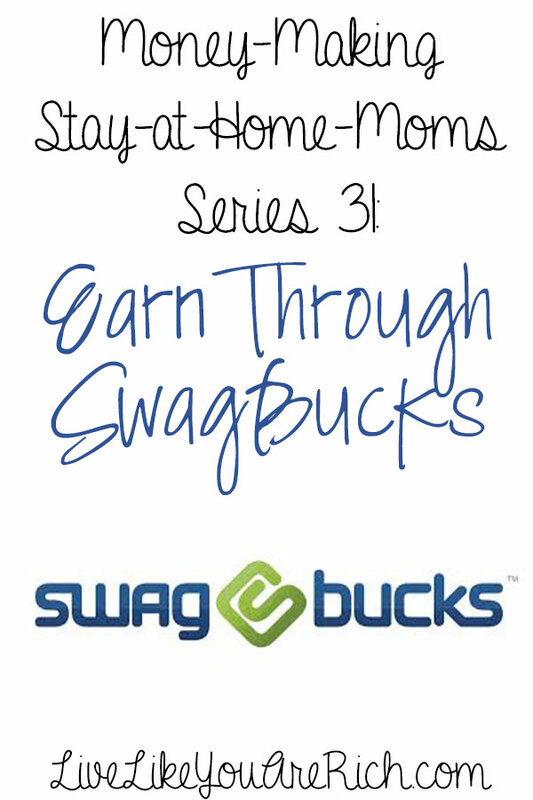 Join SwagBucks here. And use as many ways as you can to earn SwagBucks that you can. It really is super simple. Trust me, if it wasn’t simple, I would not do it! I (Anita author and owner of LiveLikeYouAreRich.com) want to tell my friend thank you for this interview. I want to add additional info on how SwagBucks works below. This is an article I recently wrote (I too earn gift cards through SwagBucks-which is why I found this friend and asked her to do this interview). I felt that it would be more than appropriate sharing more details on how SwagBucks works here. 1. Watch Videos, Movie Trailers, the News, and Other Videos. You can watch videos, movie trailers (my husband and I always do this before deciding what show to see), news, celebrity watch, and more to earn points! Easy right? Another way I earn money is by printing off coupons and use them to save money while grocery shopping. If you don’t know how to coupon, check out this post here: Couponing for Beginners: 11 Tips that Will Save You Thousands and make sure to print from SwagBucks.com. Simply click Shop>Coupons>Printable and sift through tons of high valued coupons and start racking in the SB points. You earn 10 SB for every coupon you redeem at your local grocery store! Making money while saving is pretty cool. There is also a super quick ‘Daily Poll.’ Answer an easy question and earn one SB point! Online shopping is so convenient. Head over to SwagBucks and click on the store before ordering. Stores display how many SB points you’ll earn per dollar spent. I appreciate knowing what I will earn back before buying. There is no sense in not trying this if you ever shop online! You can earn SB by booking through Expedia, Hotels.com, Priceline, Orbitz etc. through the SwagBucks website! 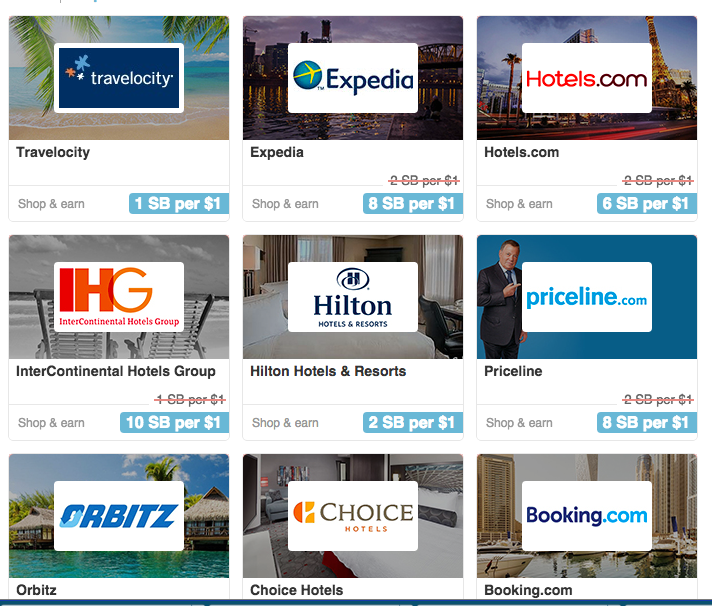 I love many of these sites and use them almost every time we travel. If you are going to use these travel sites anyway, make sure to earn SB points while doing it! SwagBucks has a search bar powered by Yahoo!. It is similar to Bing, Google, etc. By searching for terms, information, ideas, etc. you can earn SB points! Thinking of trying an online offer such as an Audibles subscription or Proactive face wash? Search SwagBucks to see if the program you want to try is offered. Many of these have rules and things you need to be careful about, so keep that in mind. Finally, there are daily tasks you can do (they reset every day) to earn easy SB points. Take the Daily NOSO. NOSO allows you to earn SB points just by signing up for OR skipping online offers. I just got a 20% off coupon to JoAnn’s and a 15% off coupon to Crayola.com by completing the NOSO. Just be sure to click Skip if you aren’t positive you want to try the offer out. Once you have 300 SB’s, You can redeem them for a $3.00 gift card. I just cashed in enough SB’s for a $10.00 Amazon gift card. I’m almost to $3.00 again! 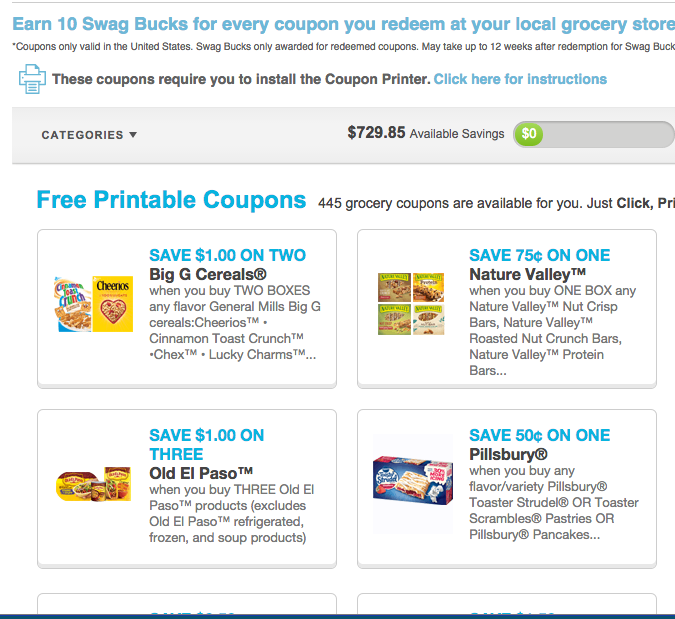 The points add up quickly (especially if you print the printable coupons from the site) if you are consistent. Once you are ready to get your gift card, just click Rewards under the Redeem section and search for the company you want a gift card too! Add it to cart, verify it via the email confirmation and once it’s approved you can spend your earnings. If you refer friends who then earn SwagBucks you can earn points that way as well. See SwagBucks website for details on this. By the way, you can earn SB on any device: your phone, tablet, desktop, and laptop. Sign up for Swag Bucks here. For other ‘rich living’ tips and craft projects, please subscribe, like me on Facebook, and follow me on Pinterest. Hey, the very useful article you have shared with us.